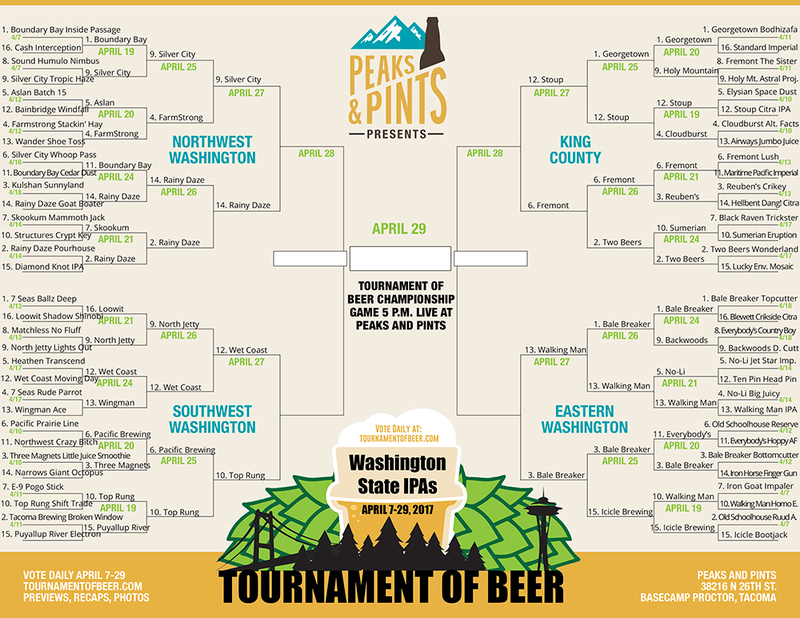 Tournament of Washington IPAs: Hot Break Eight — Indeed, the Hot Break Eight is fully fleshed out: Silver City Tropic Haze IPA, Rainy Daze Goat Boater IPA, Wet Coast Moving Day IPA, Top Rung Shift Trade IPA, Stoup Citra IPA, Fremont Lush IPA, Walking Man IPA and Bale Breaker Bottomcutter IIPA. It’s interesting to note that that Bale Breaker is the highest seed remaining in the Tournament of Beer, a No. 3, and the only double IPA in the group. Surprisingly, only one Hazy IPA made it to the Hot Break Eight, Tropic Haze. It’s all come down to eight. All the signs in the breweries, the mass emailings to customers and friends, the IPA phone trees have paid off for these eight IBU slingers. It’s now do or diacetyl time for the IPA royalty. Rainy Daze Brewing founder and head brewer Mike Montoney had a chill day. He didn’t need to check his Twitter feed for Tournament of Beer updates. He didn’t need to conduct TV interviews outside his Poulsbo brewery offering thoughts on clear versus hazy IPAs. He could post cat pictures on Facebook instead of dressing his IPAs with medals for photo shoots. His two Tournament of Beer nominated IPAs faced off yesterday, with the younger, hipper, hoodie wearing Goat Boater IPA receiving the most votes, 78 percent, and a spot in the Hot Break Eight. No time for deep analysis. Silver City Tropic Haze awaits. It’s too tempting to say. How can we not? Lights out Lights Out IPA. 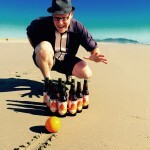 Despite an early lead from the heralded North Jetty Brewing, Wet Coast Brewing and its large, devoted Gig Harbor resident airline pilot fan base proved too powerful in yesterday’s action, catapulting Moving Day IPA into the Hot Break Eight with the closest victory margin of the day — 55 percent. North Jetty and their Lights Out Double IPA will survive. The Washington coast brewery has been drawing large crowds from the day it opened on the Long Beach Peninsula. Lush IPA, a surprise low seeded but heavy favorite to win the King County Region after perceived contenders such as Maritime Pacific Imperial Pale and Reuben’s Brews Crikey IPA were dismissed in earlier rounds, cruised to victory over Two Beers Brewing’s Wonderland Trail IPA. The large hiking/drinking community filled Two Beers’ “Woods” taproom all day. But, it wasn’t enough. Fremont Brewing pushed its Lush hard, tossing in their Interurban IPA periodically (ballsy). Lush IPA grabbed 62 percent of the vote and moves into the Hot Break Eight to take on Seattle darling Stoup Citra IPA. Walking Man Brewing has been brewing craft beer in the Columbia Gorge for a decade and a half. Their experience showed during yesterday’s game against No. 1 seed Bale Breaker Topcutter IPA. Ignoring the late-afternoon penalty Bale Breaker received for parading its entire top cutter machinery along Highway 24, Walking Man IPA’s 70 percent of the vote victory came from the one-two punch of Pacific Northwest hops and English, German, and American malts. Sometimes, you have to go with what you know. Walking Man IPA moves into the Hot Break Eight for a game against the other Bale Breaker delicious IPA, Bottomcutter IIPA. OK, pour a pint and dive into today’s Hot Break Eight battles. Vote for one IPA per game, and only once. Voting for today’s IPA battles ends at 11:45 p.m.
It’s the battle of the votes. Technically, all the Tournament of Beer games have been battles of the votes, but these two IPAs have garnered their fair share of lopsided vote tallies. If voters don’t engage in long, multi-scenario discussions about what these two IPAs’ mascots should look like and which one would win in a fight-to-the-death battle royal, but rather concentrate on which IPA should be crowned the IPA King of the Peninsula, this should be the closest contest of the day. Vote now! This game will make you laugh. Chuckle, actually. But, that’s not shocking. If you read these daily Tournament of Beer quips you’ve arrived at the conclusion that South Sound breweries are a happy-go-lucky bunch. Expert Tomfoolerypeople, if you will. This game will follow suit. Keep an eye on Facebook. That said, South Sounders know Shift Trade is an easily likeable and drinkable IPA with mango, apricot, and pineapple notes and a solid, slightly toasty malt core. Top Rung brewers Jason Stoltz and Tyler Mathis have adjusted their IPA hopping techniques in the past year and it has paid off. Thirty seven miles north, Wet Coast also builds its IPA on a solid malt bill, Munich and Crystal malts to be exact, with bold, tropical hops and a lingering bitterness throughout. Enjoy the friendly, fun banter but don’t ignore the craft. We’re not sure how to describe this game. Stoup Brewing versus Fremont Brewing could end relationships, cause electric car title exchanges and ignite fights in the rotisserie chicken line. Celebrity brewers, lively taprooms and two IPAs that are equally outstanding. Glad you’re voting and not us. Don’t stop to wonder how important your employment actually is considering you haven’t wholeheartedly worked on anything since the Tournament of Beer started. Today won’t be much different. Bottomcutter IIPA and Walking Man IPA are award-winning craft beers. Depending on your own personal criteria for what constitutes a “great game,” there’s certainly a case to be made for this game. This has the potential to be an offensive showcase the likes that hasn’t been seen in the Tournament of Beer. Let’s get ready to Siiiiiiimmmmmmmcoe!